So why do I? Write, that is. These were the opening lines as I ventured into the land of blogging about a year and a half ago. At the time it was the introduction to my raw thoughts and emotions, merely two weeks removed from my husband’s death. I wrote then because I was compelled to. I needed an outlet, a way to make sense of the tsunami around me. At first writing was just for me. Then it was to confront stereotypes and show the reality of grief. Now it’s morphing into a desire to equip and encourage. Over the months I remembered just how much I LOVE to write. God stirred a passion that had lain dormant till tragedy forced it to awaken. Today writing takes another step. A couple weeks ago, my sweet friend Kit Hinkle from aNew Season asked if I’d like to be part of a blog hop. “A blog hop? What is such a thing?” said I. “Well, another blogger will hop to me and then I’ll hop to you and two others. It’s a chance for all of us to write about the same topic.” I was intrigued. I’ll get on to “hopping,” but first let me tell you about Kit. She’s a lady I value as an “older sister”, one further down the path of widowhood. She is the mother of four teenage sons and also leads the team at aNew Season and A Widow’s Might. She and her team write for thousands of ladies about everything from divorce, to an empty nest, to a new baby, to widowhood. They desire to point to women to Jesus in all of life’s seasons. The first time Kit and I chatted on the phone we talked for over an hour. I was overwhelmed that such a busy lady would take time to encourage me! It’s been priceless to talk to someone who knows. So a blog hop with Kit? Yep. Sign me up. Here goes, writing about writing, a little metacognition if you please. Well in every post, you”ll see the gospel woven throughout. The gospel is a diamond with many facets. It’s not merely a buzz word. It’s for all of life, and is the power to become like Christ. The gospel reminds me of who I am, lost and found in Him. So, you’ll see the struggle to believe, the pain, or the story, but you will always be pointed back to the main thing– the life, death, burial, resurrection, and reign of Jesus. You’ll see redemption, adoption, reconciliation, propitiation…You’ll see gospel application to the messiness of daily life. Also, I’m writing from within. When I first started seeking resources for grief and suffering, much of what I found was written several years later in reflection. Well, I thought it was time for the perspective of one who’s in it. Blogging is my journey with grief from 2 weeks to where I am now- a year and a half. I was 14 and didn’t know much about what it meant to be a Christ-follower, but I did get that I needed a Savior. I didn’t know that He had chosen me before the foundation of the world, but I knew I wanted to follow Him. I knew He loved me. I knew He died for me. So, I guess that’s why I write. This life is not my own. “I am crucified with Christ. It is no longer I who live, but Christ who lives in me. And the life I now live in the flesh I live by faith in the Son of God, who loved me and gave Himself for me.” Galatians 2:20. I write out of praise and thanksgiving. I write because I’m compelled to. Any talents I have are gifts from God, to be developed and used for His kingdom, His glory. 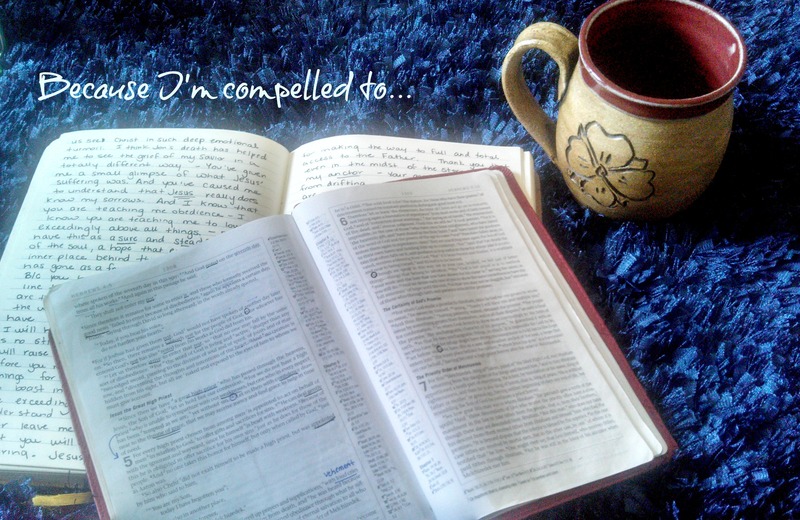 I write from a place of delight in Jesus, in all He is and all He’s accomplished. I write what I do because I want to make much of Christ. Most often writing comes from the daily occurrences that stir my soul.- my husband’s shampoo, playing a board game, or going to the fair. I write to process the struggle. A few weeks ago I felt bombarded with a million lies, so I have a post coming soon about fighting them. I also write to nail down the BIG truths and crossroads moments. I find that when I write something real to me, the thoughts come quickly, taking shape in about a half hour. Writing to instruct takes much longer, though. I wrote and rewrote a post about applying the gospel in sorrow for several weeks before I felt satisfied with it. I often let close friends preview my writing to help edit and refine ideas. I’m still learning how to be a writer, so I’m sure my writing process will continue to develop! Mostly, I pray. I pray that the Holy Spirit would lead. I pray that He would encourage the ones who need it. And I pray that Christ be magnified, and that I fade into the background. So why do I write? Because I’m compelled to. That’s the simple answer. Trisha White Priebe– I first met Trisha in college as part of a student work program. I recall her beautiful smile and vibrant joy. She seemed like one of those people who could light up a room. Trisha and her husband published a book called Trust, Hope, Pray: Encouragement for the Task of Waiting. She is also currently co-writing a novel with Jerry B. Jenkins. It also seems like she has a “dark secret.”— She’s addicted to home management. But I think I’m supposed to keep that on the down low. You’ll just have to hop over to househoncho.com to get the rest of the scoop! Rachel B. – Rachel and I go way back, but some of my most beautiful memories of Rachel surround her using her talents sacrificially to help my wedding day come off without a hitch. Jon lovingly called her our “Wedding Nazi.” The day wouldn’t have fallen apart without her! Rachel is a wife, a mother of three, with one on the way, and one in heaven. She writes about the every day joys and challenges of motherhood, and just the beauty of life itself. I love the way Rachel crafts words! My heart is always encouraged by her beautiful simplicity. Even just the blog name Une Bonne Vie intrigues me to read more! Becca Kaser– Becca is a new friend to me, but one of my husband’s friends from college. She recently created her blog Daily Joy, but it’s already a refreshing blessing to me! I love the reminders that daily joy comes from satisfaction in Christ. “Hello my name is Rebecca Kaser and I struggle with anxiety. Phew. It feels good to get that out. But, I’m learning I am not the only one. So, instead of letting my anxiety absolutely destroy my joy, I am going to strive to find joy in my daily journey. I am a new stay-at-home momma just trying to figure this whole new role out. Thanks for hopping with me friends! Next > When lies are like lions. Ami, I love this! Thank you for testing out the land of blog hopping with me! Fun isn’t it? Kit, yep a pretty awesome adventure! I’m excited to see how God uses it to bless and encourage!